After months of tensions over Brexit, this past weekend was highly anticipated due to the special summit of the European Union (EU) on Brexit, which ended with an approval of the deal that sets the roadmap for the United Kingdom’s break from the European Union. While the discussion among the 27 members reportedly took only 38 minutes, it aimed to deliver a smooth divorce. Today, the UK Prime Minister May assembles her cabinet to sell the deal at home ahead of a parliamentary vote in December 2018, with opposition parties align against the current proposal and more than 90 Conservative Members of Parliament openly registered their disapproval. The United Kingdom (UK) consumer price index (CPI) year-on-year came in unchanged at 2.4% in October, the same as in September but missing analyst forecasts of a 2.5% increase. Prices slowed for transport and food but rose faster for housing and utilities, recreation and culture. On the other side of the Atlantic, the University of Michigan’s consumer sentiment for the US fell further to 97.5 in November, comparing to 98.6 registered in October and failed the preliminary reading of 98.3. It is the lowest value in three months. Both current conditions and expectations were revised lower although the drops were more related to income. Since the beginning of 2018 until last Friday close, the GBPUSD remains negative with a loss of over 5.0% but since the start of November remains above water with a 0.25% gain. Nonetheless, the week ended with a loss of 0.22% and on the daily time-frame, the currency pair closed in the red with a loss of almost 0.58%. Furthermore, the GBPUSD is in a bearish phase since early November. During last Friday session, the currency pair dived with a narrow range ahead of the special summit of the European Union (EU) on Brexit and closed near the low of the day, however, managed to close within Thursday range, which suggests being slightly on the bearish side of neutral. The stochastic is showing lack of momentum although is below the 50 midline. In late October, the GBPUSD found enough support near 1.1269 to break the bearish momentum and bring out the bulls pushing it back up. 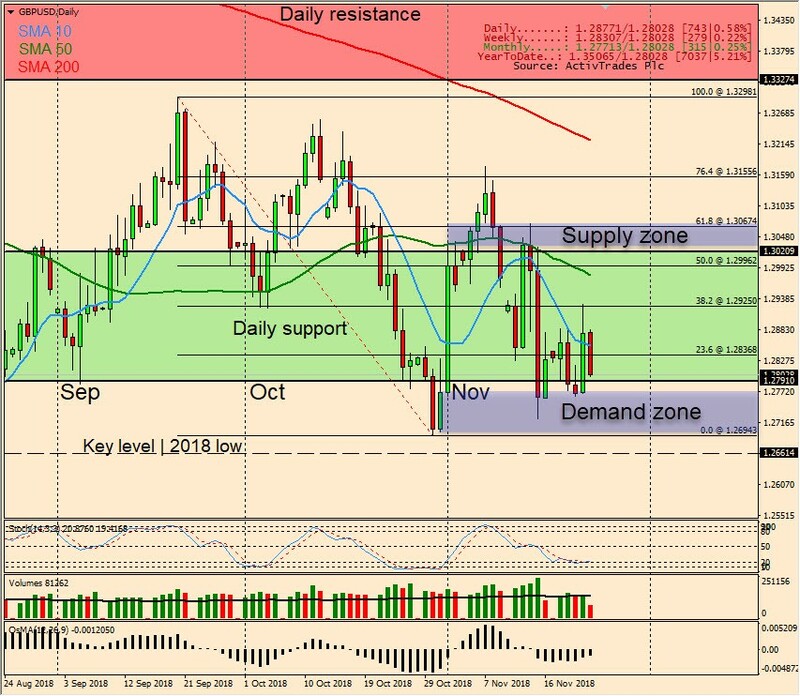 In early November the price of the currency pair was trapped between the 76.4 Fibonacci retracement at 1.3155 (resistance) and the 50-day moving average now at 1.3047. A break below this level set in motion a downward move toward October low at 1.1269. Since mid-November, the currency pair has been consolidating from 1.2880 down to 1.2761 where there is a demand zone. Monday, November 26, 18:30 GMT (13:30 ET): The Bank of England (BoE) Governor Mark Carney is scheduled to speak. As head of the BOE’s Monetary Policy Committee (MPC) which controls short-term interest rates, Carney exerts significant influence over sterling’s value. Moreover, Carney’s speeches are closely watched by traders and investors alike for insights regarding future monetary policy and interest rate shifts. His comments may determine a short-term positive or negative trend for the Great Brittan Pound (GBP). Wednesday, November 28, 13:30 GMT (08:30 ET): The US Bureau of Economic Analysis is scheduled to release the preliminary gross domestic product (GDP) annualized for the third quarter, which is expected to come in unchanged at 3.5%, the same as the previous period. The GDP Annualized is a gross measure of market activity because it indicates the pace at which a country’s economy is growing or decreasing. Normally, a high reading or a better than expected number is seen as positive for the USD, while a low reading is negative. The Bureau of Economic Analysis, Department of Commerce is scheduled to release the preliminary Core Personal Consumption Expenditures quarter-on-quarter in the third quarter, which is expected to come in unchanged at 1.6%, the same as the previous period. This economic indicator is considered an important gauge of inflation. Generally, a high reading is positive for the USD, while a low reading is negative. Wednesday, November 28, 17:00 GMT (12:00 ET): The Federal Reserve (Fed) Governor Jerome H. Powell is scheduled to speak. As head of the Fed, which controls short-term interest rates, he holds sway over the US dollar; and traders closely watch his speeches as they are often used to drop hints regarding future monetary policy. Thursday, November 29, 13:30 GMT (08:30 ET): The US Bureau of Economic Analysis is scheduled to release the Core Personal Consumption Expenditure – Price Index year-on-year in October, which is expected to come in unchanged at 2.0%, the same as the previous period. The “Core” excludes seasonally volatile products such as food and energy in order to capture an accurate calculation of the expenditure. It is a significant indicator of inflation. A high reading is positive for the USD, while a low reading is negative. Thursday, November 29, 19:00 GMT (14:00 ET): The Federal Open Market Committee (FOMC) is scheduled to release its meeting Minutes, which are released by the Board of Governors of the Federal Reserve (Fed) and are a clear guide to the future US interest rate policy.